Hi, I am interested in your 2015 Chevrolet Corvette Z06 Coupe (stock #4711-ATL) listed on Autotrader for $74,995. I'd like to get more information about this vehicle and confirm its availability. Imagine the feeling that can only come from climbing behind the wheel of one of the most powerful production cars on the road. This 2015 Chevrolet Corvette Supercharged Z06 can provide it. Its unusually lightly travelled, having logged only a touch over 7000 miles and is an absolute scorcher, offering adrenaline-inducing acceleration that puts it in very select company. The notion that youre casting eyes on a very special car will appear right away - even in the exalted company of modern Corvettes this one will readily stand out, and youll want to immediately take a closer look at this stunner to fully appreciate the showroom condition that its in. Its Shark Gray metallic exterior is a sort of visual homage to the Vettes of yesteryear, the third generation of which was very closely based on the Mako Shark concept car that stunned car show audiences with its futuristic look back in the mid-60s. That distinctive paint is still looking its best and black carbon fiber splitters on the front, rear and sides as well as the jet black wheels, provide just the right amount of contrast. Its targa top is another nod to those third-generation predecessors, the first of the model to emerge from the assembly line in this configuration. Its a feature thats proven immensely popular over the years, offering all the exhilaration of open-air motoring with the shelter of the snug fitting top just a couple of steps away. The Kalahari leather interior waiting inside the doors is about as clean as interiors come - this Vettes light usage has definitely paid some dividends here. This is an unusually comfortable driving environment for any car, let alone one that offers the world class performance that this one does. The steering column both tilts and telescopes and the ultra-clean and distinctive buckets glide smoothly into place to provide just the right comfortable driving position and theres a surprising amount of shoulder room inside - far more than many of the Vettes exotic competitors. The air conditioning is working at full force for maximum comfort and the featured navigation system will point you exactly to where youre going - and no doubt youll be able to get there at warp speed. Therell certainly be no shortage of audio options, either - the AM/FM/DVD stereo also features satellite and Bluetooth connectivity. 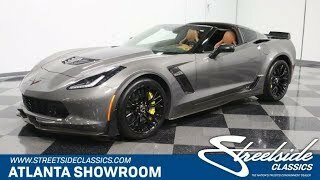 Chevy has gone to great lengths over the decades to arm its Corvettes with world class powerplants, and the 6.2 liter supercharged V8 650 horsepower lurking under the hood of this Z06 represents a definite high water mark of engineering. As far as sheer performance is concerned, blistering straight ahead acceleration is not this Z06s only forte, although, armed with a 7-speed manual transmission its ability to log a quarter mile in just a touch over 11 seconds does put it in world class company. Its road hugging agility is virtually unparalleled - when tested on the skidpad, the 2015 Z06 logged an otherworldly 1.19gs, prompting Motor Trend to declare the reading the highest theyve ever seen from anything that wasnt a race car . Equipped with the Brembo ceramic power disc package that places eye catching yellow calipers at all four corners, this Chevys stopping ability is also nearly beyond belief - Car and Driver noted that it can come to a dead stop from 70mph in just 128 feet, the best they had ever experienced in a production car. Jet black special edition Z06 wheels - 19 in front and 20 in back and wrapped with Michelin tires - finish this extraordinary car off in just the right fashion. True super car performance is hard to come by and certainly far harder without paying a kings ransom, and yet thats what this 2015 Chevrolet Corvette Supercharged Z06 offers. Call today!